Ice cream is a sweet treat that people have been eating since the Romans created flavored ices in the fourth century B.C! But in addition to being a delicious dessert with a long history of delighting the taste buds, ice cream also provides a healthy amount of nutrients to your diet. Prepared by stirring, while freezing, a pasteurized mix of one or more dairy ingredients, sweetening agents, flavorings, stabilizer, emulsifier and optional egg or egg yolk solids or other ingredients. Federal standards require ice cream to contain a minimum of 10% milkfat and 20% total milk solids by weight. Like ice cream, but contains a higher content of egg yolk solids. Reduced fat ice cream contains 25% less fat than the original product. Lowfat ice cream contains less than 3 grams of fat per serving. Fat free ice cream contains less than 0.5 grams of fat per serving. Low in milkfat and solids with 1 – 2% milkfat and 2 – 5% total mild solids. Water, flavoring, sweetener, and stabilizers are added. It has more sugar than ice cream. Added Flavoring must be identified on the label as natural, naturally flavored, or artificially flavored (e.g. 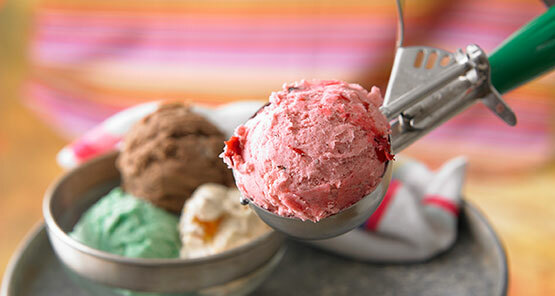 raspberry ice cream, raspberry flavored ice cream, artificially flavored raspberry ice cream). While ice cream is made, air is whipped into it increasing its volume. This increase in volume is known as overrun. Overrun does not have to be declared on the label. Generally, the higher the overrun, the lower the cost of the ice cream. Ice cream has a great deal more nutritional value than its dessert counterparts, such as cake, pie or candy. 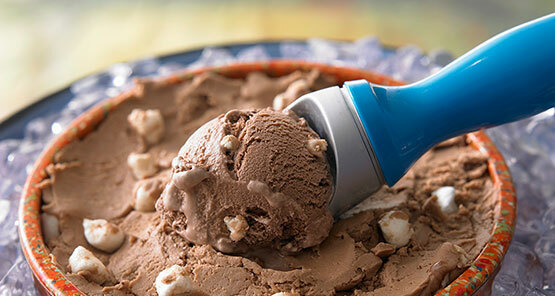 Calcium, riboflavin (vitamin B2), and protein are the primary nutrients in ice cream. Store ice cream tightly covered at 0 degrees Fahrenheit. To avoid crystallization and volume loss, scoop out ice cream, keeping surface as level as possible. Cover surface with plastic wrap before re-closing and return to freezer immediately. Top fruit juice with a scoop of ice cream or sherbet. Arrange assorted fresh fruits around a scoop of fruited ice cream. Complement a main dish with ice cream or sherbet (e.g. cranberry with poultry, orange with pork, mint with lamb and cherry with game). Top a stirred custard with a scoop of vanilla ice cream instead of meringue for an easy Floating Island.